Where can I find Regulations, IRs, AMCs and GMs concerning ATM? Is there a consolidated version of Regulation (EU) 2017/373? What is the status of documents published during the EASA Rulemaking process such as Notice of Proposed Amendment (NPA) or Comment Response Document (CRD)? Can they be used if there is no EASA rule available? NPAs and CRDs are part of the Agency's rulemaking process to inform and consult stakeholders about possible rule changes or newly developed rules. The proposed rules, (provided in an NPA), are obviously not binding and still subject to change, either during the EASA rulemaking process or the Commission's comitology process. While a NPA and CRD may give a broad indication on how the future rule could look like, the Agency generally does not recommend using them before the final rules are published. What is the 'Cover Regulation'? establish the applicability and enter into force dates, including any grandfathering and transition measures for the adaptation to the new rules. What do 'enter into force' and 'applicability' mean in the Cover Regulation? When Regulations are published in the Official Journal of the European Union they invariably include several dates. The date of entry into force is usually expressed as the 20th day following publication of the Regulation in the Official Journal of the European Union. It means that the EU rules have been adopted and published - thus producing legal effects - but are not necessarily mandatory on the date of entry into force. The date when they become mandatory is the date of applicability. The Regulation (EU) No 2017/373 entered into force on 21 March 2017 and the dates of applicability are specified in Article 10. Which ATM/ANS providers fall under the EASA Basic Regulation and its implementing rules? The services included in the definition of ATM/ANS are schematically represented in the picture below. What are the main regulations governing ATM/ANS? Regulation (EC) No 552/2004 of the European Parliament and of the Council of 10 March 2004 on the interoperability of the European Air Traffic Management network (the interoperability Regulation). Amended by Regulation (EC) No 1070/2009 of the European Parliament and of the Council of 21 October 2009 amending Regulations (EC) No 549/2004, (EC) No 550/2004, (EC) No 551/2004 and (EC) No 552/2004 in order to improve the performance and sustainability of the European aviation system. It shall be noted that COMMISSION IMPLEMENTING REGULATION (EU) 2017/373 of 1 March 2017 laying down common requirements for providers of air traffic management/air navigation services and other air traffic management network functions and their oversight is an implementing rule to both SES Regulations and EASA Basic Regulation. Note: Implementing Regulations (EU) No 1034/2011 and (EU) No 1035/2011 will be repealed as from 2nd January 2020 (Applicability Date of Regulation (EU) 2017/373). What is the difference between ATM and ATC? According to Definitions in Article 2(1) and (10) of Regulation (EC) No 549/2004 of the European Parliament and of the Council of 10 March 2004 laying down the framework for the creation of the single European sky. Is ATM/ANS personnel covered by Regulation (EU) 2017/373? ATSEP – Air Traffic Safety Electronics Personnel are covered. Those can be found in Annex XIII – Part – PERS of Regulation (EU) 2017/373. Who is the ATM/ANS Competent Authority in my country? The competent authority responsible for the issuing of certificates to service providers, for the acknowledgment of receipts of declarations made by providers of flight information services where relevant, and for the oversight and enforcement in respect of service providers shall be the national supervisory authority. Who is the competent authority for ATM/ANS Pan-European services? ‘Pan-European service’ means an activity which is designed and established for users within most or all Member States and which may also extend beyond the airspace of the territory to which the Treaty applies. The competent authority with regard to Pan-European services (e.g. DAT providers, the Network Manager, etc.) shall be the Agency (EASA) as defined in Article 4(1) of Regulation (EU) 2017/373. 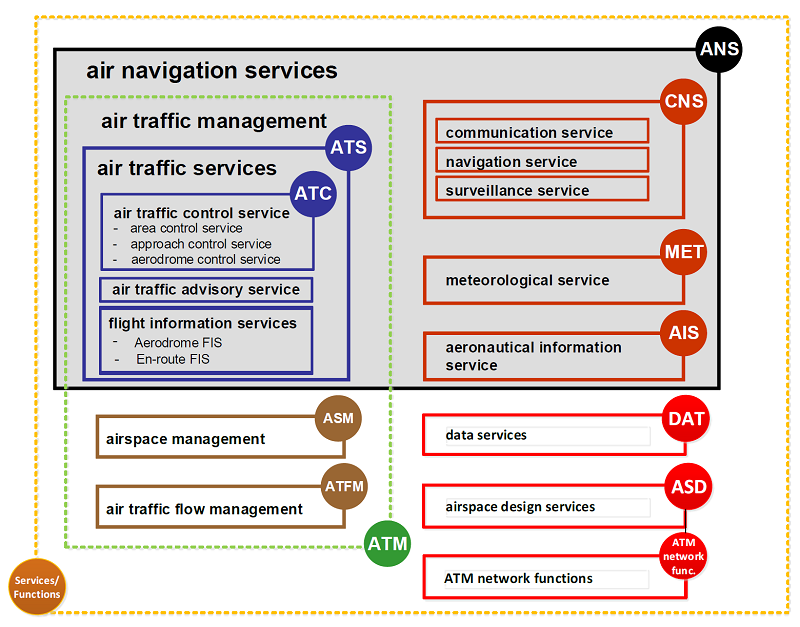 What are Air Navigation Services (ANS) according to EASA?